China Is Up 32% in 2019... Stop Procrastinating Now! I've been absolutely pounding the table for you to buy Chinese stocks this year. I sure hope you've listened. The Shanghai Composite Index is up 29% year-to-date in local currency... and 32% year-to-date in U.S.-dollar terms. So $10,000 invested in China at the beginning of this year would be worth $13,200 today. And the year is only three months old! If you've stayed on the sidelines, you might think it's too late now... "Up 32% already? I missed it, Steve. I should have listened sooner." It might be hard to believe... But no, you didn't miss it. A 32% gain in a quarter would mean you missed it – in most other markets. Usually, that would be an absolutely stellar year's worth of returns in the stock market. Heck, U.S. stocks only jumped 20%-plus in a calendar year three times during the current bull market. You have to remember something, though... China isn't like other markets. It doesn't work by the same "rules." So no, you haven't missed it. Not even close. China's stock market is famous for huge booms and busts. And we're in the middle of one of those booms today. Look closely at the chart again. Look back around 2005. The Shanghai Composite started that period at around 1,000 points – the same price it traded at roughly a decade prior. Then, Chinese stocks took off. Within two years – in late 2007 – the index peaked at around 6,000. In other words, it soared sixfold. A total return of roughly 500% in less than two years... from a broad market index. That's practically unheard of... anywhere except China. Of course, these kinds of booms come with busts as well. For example, the index peaked at more than 5,000 in 2015... And it bottomed out below 2,500 early this year. In other words, it lost half its value. Any way you look at it, China's stock market had a massive bust. You have to be aware of these kinds of busts when you invest in China. You see, before that big 2015 bust, the Shanghai Composite stood at around 2,000. The entire market more than doubled in roughly one year. The point is, when Chinese stocks get going... THEY GO. And they're going RIGHT NOW. The Shanghai Composite is up 32% so far this year. But you haven't missed it. History says we could see triple-digit gains over a period of two years – or even less. Stop procrastinating. It's happening now. Don't get left behind... Get on board! P.S. If you want to learn my favorite one-click way to invest in China today, the latest issue of my True Wealth newsletter shares all the details... Learn how to sign up right here. 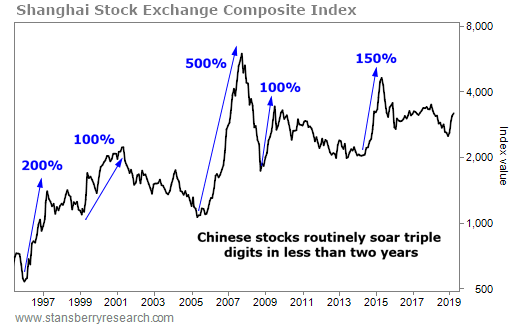 "The long-term opportunity in Chinese stocks is too good to pass up," Steve writes. 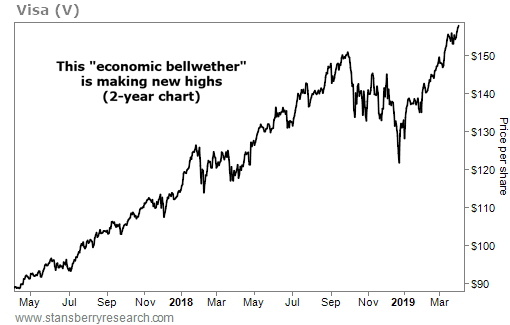 Get the full story on a sentiment shift that could help kick off the next China boom here: A Cryptic Headline Says $2 Trillion Could Flow Into Chinese Stocks. Recently, one of Steve's China stories took a giant step forward... And this means two powerhouse companies can finally soar to their true potential. Learn more right here.